2018 is almost over as we’re gearing up for another amazing year ahead and hopefully you're just as excited as we are! 2018 was a very busy year in the development for BookSteam, so we thought we would reflect back on what we were able to accomplish this year. It is useful for those staff members who have fluctuating schedules throughout the year. For example, in March staff, Monica, is working Tuesday through Saturday 9:00am to 5:00pm, but in May it changes to 11:00am to 6:00pm. Find out more here. Parents (or anybody else) are able to book multiple kids/participants into the same class. Find out more here. You can now manage your products, brands, vendors and product orders with ease. Find out more here. 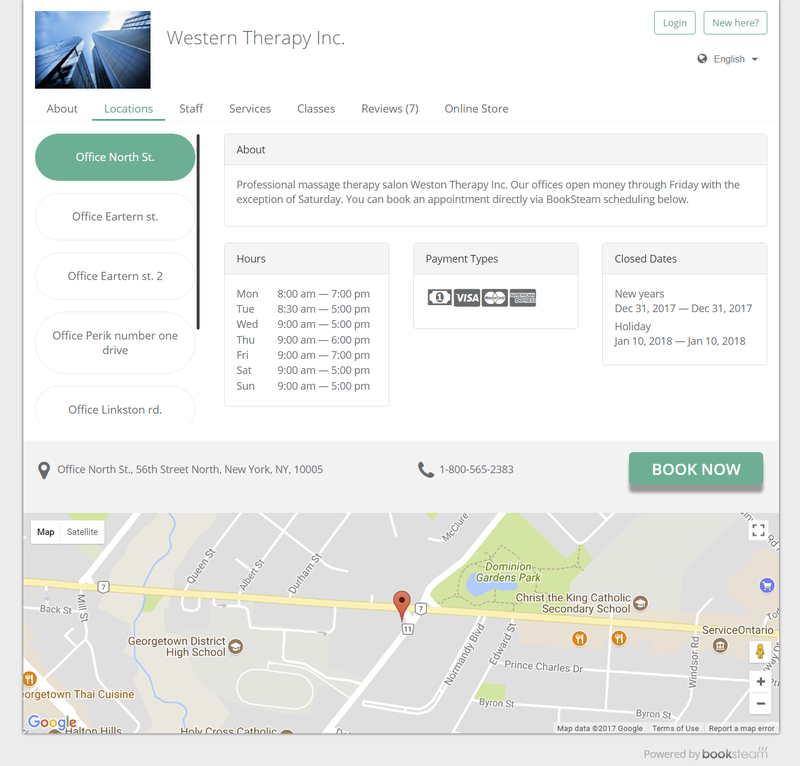 You are now able to raise invoices for appointments, classes, products and packages. Find out more here. You can now customize email notification messages that your clients receive. Find out more here. Calendar monthly view for Staff and Resources. Find out more here. You can now change your calendar week start day. For example, in your calendar you can see Monday, Tuesday, Wednesday, Thursday, Friday, Saturday, Sunday or you can change it to Sunday, Monday, Tuesday, Wednesday, Thursday, Friday, Saturday. Find out more here. You can now see all staff or all resources at the same time in a weekly view. Find out more here. You can now download your BookSteam subscription invoices directly from My Account > Payments & Invoices tab. Businesses are able to print a report with All Staff in a Monthly View. Find out more here. Businesses can now run and export various reports. Find out more here. Another awesome feature from BookSteam! 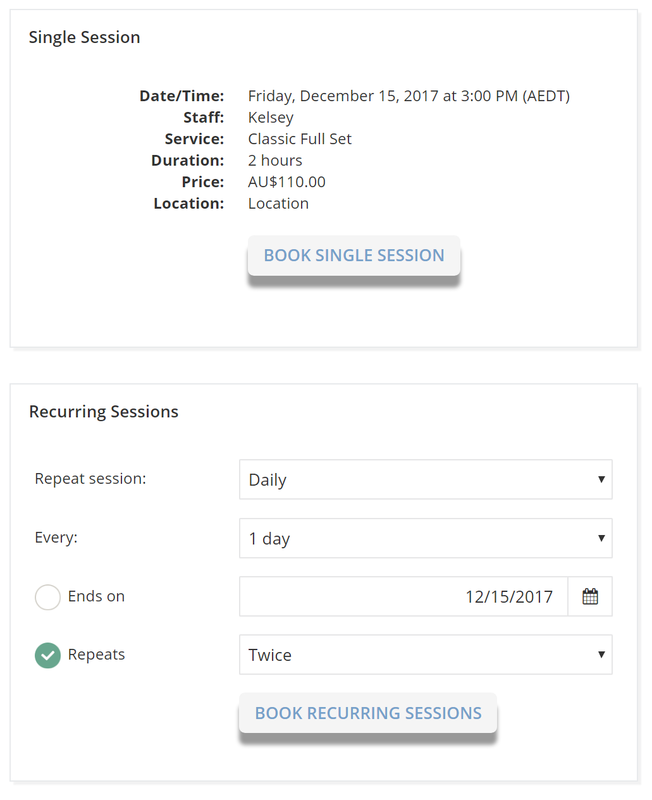 Clients can now book multiple participants per class session. Give me an example where it would be useful? Mike has two kids, Jill and Patrick, who both love Math. Mike wants to enroll both of his kids into the mathematics class. School that offers math classes uses BookSteam to schedule classes online. Mike goes to the school's BookSteam booking page, selects two participants, picks class date/time, enters information for both kids and books the class. It's that easy! For more details, see our help link section here. Stay tuned for more exciting new features coming soon. We're excited to let you know that the staff future working hours, one of your most requested features, is now live! 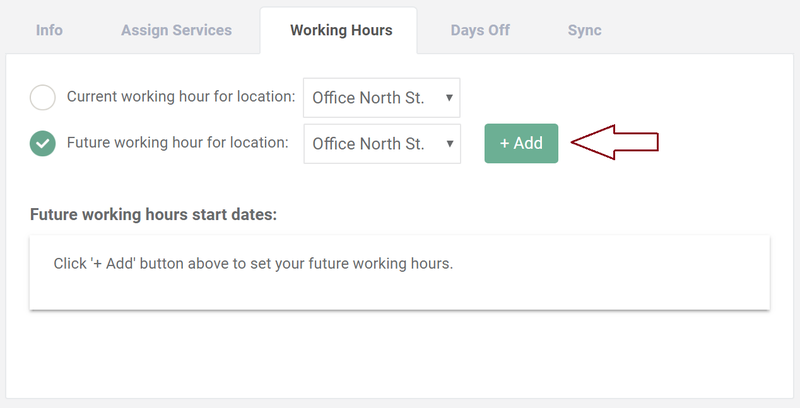 You can now setup future working hours for Staff members. It is useful for those staff members who have fluctuating schedules throughout the year. For example, in January staff, Jenna, is working Monday through Friday 9:00am to 5:00pm, but in February it changes to 11:00am to 6:00pm. To set it up, simply go to the staff profile (located under Settings/Staff), open 'Working Hours' tab, select 'Future working hours for location:' option and click '+Add' button. From there, set your new future working hours and click 'Save'. For more details see our help link by clicking here. Alternatively, see all other time management tools for Staff here. Stay tuned for more exciting updates. New features coming soon. ‘About’ section was also added to the booking page. To add a description to the 'About' section, go to Settings>Business Details tab and under About field enter desired text. 'About' section can now be set as a default landing/home page on your booking mini website in the Marketing>Mini Webpage tab under 'Default Homepage display tab:' option. Lastly, Look and Feel tab was updated as well to better match your business design aesthetics. 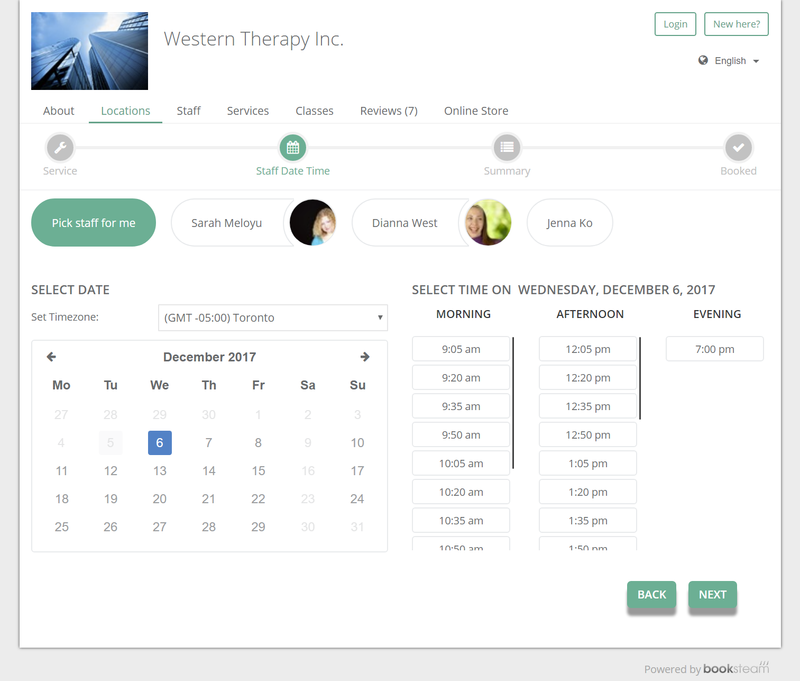 With our latest feature, clients can now book recurring appointment or class sessions online. To activate this feature please navigate to the Settings > Preferences > Scheduling Rules tab, enable recurring option for appointments and/or classes and click 'Save'. When clients book online, they will be presented with the option to book single or recurring session. We received many emails from our customers requesting for classes to be displayed in a list view on their booking page. To bring this awesome feature to you as soon as possible our development team has been working overtime. Now the List view option is finally here! Show me an example of this List view! In the list view, you can display or hide days that do not have scheduled classes. This option is located in the Settings > Preferences > Scheduling Rules tab under Class Rules section. You can also display cancelled class in the list. 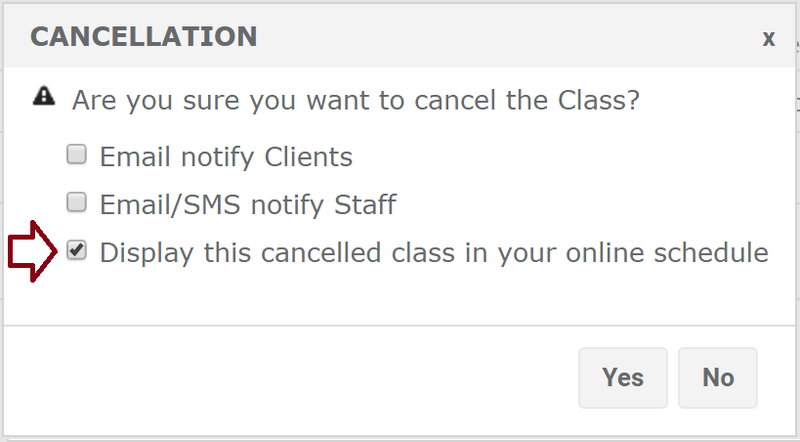 Simply cancel class from your calendar as usual and in the cancellation option select 'Display this cancelled class in your online schedule' and click 'Yes'. To view difference between List view and Calendar view see this help link. Resource scheduling was the most anticipated feature of this year and it's finally here. Resource scheduling can be used to reserve rooms or equipment which are linked to your services, preventing double bookings. Adding resources is super easy, simply go to Settings > Resources and click "Add New Resource" button. Add as many resources as you'd like and specify their location. For more information view our help link here. Under Settings > Services edit your service and link resources based on location (same applies to classes). 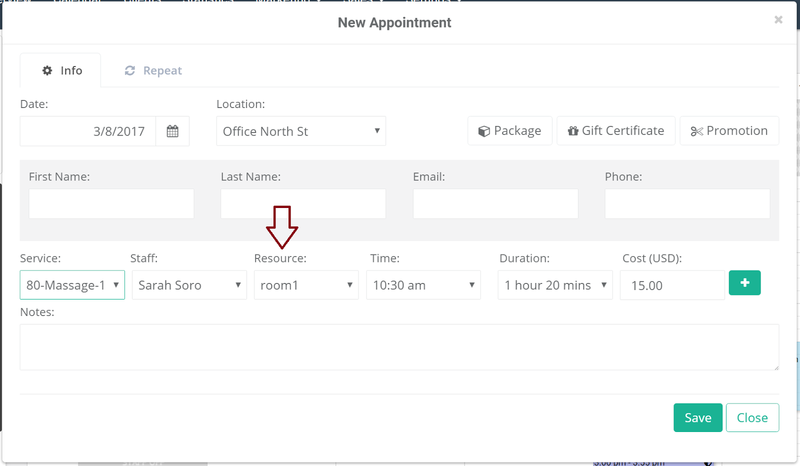 From your calendar, in the new appointment window you will see new resource selection (system will automatically assign first available resource but you can select another one). 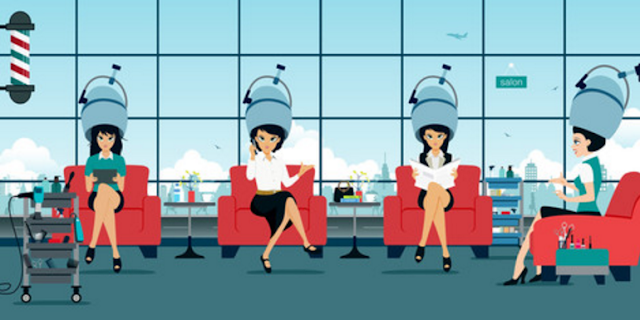 Resource allocation from online bookings will be done automatically, resources will be assigned based on their availability. For more details see out quick help guide. View booked resources in one quick glance from your BookSteam calendar.